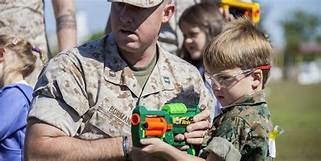 Question: Should kids play with toy guns? Unless you are a liberal and have a problem with kids being kids and don’t understand the opportunity to teach kids about responsibility and gun safety. Vogue magazine asks, "Should we still let children play with toy guns?" Pro-tip for the women cited in this article: We have THOUSANDS of strict gun laws already on the books. The problem is enforcement and those darn criminals who don’t obey them. And if you’re interested in teaching your child about proper firearm safety instead of an irrational fear, there are LOTS of resources available. For example, see here, here, here, here, here and here. From Yahoo (originally from Vogue): Over the weekend, on a party supplies run at Flying Tiger, the charming Danish discount store, my 4-year-old daughter’s eyes sparkled at the sight of a neon-color water gun. “Can I have that?” she asked—the same question she’d repeated at the sight of the modeling clay and princess crowns and silly straws. I wavered for a beat. I’d come of age in the late ’80s and ’90s—the height of the backyard Super Soaker battle. And before that water gun became the hottest ticket at Toys “R” Us, my brother and I had wielded tiny green plastic water pistols filled and refilled with rudimentary plugs, sneakily shooting each other in the eyes. I remember all of this as pure, absurd fun. “No,” I told my daughter, and briskly steered her on. I offered no explanation in the moment—and I hadn’t really turned the question over in my head before—but my gut gave me my answer: that I didn’t want to introduce her to this or any other gun in a world that already seemed to be teeming with them in movies and video games, on TV and, most of all, on the news. Her fleeting interest in the toy gun was innocent, but, sadly, my view of it no longer was. The water gun fights my brother and I used to have in the summer were from another era, maybe even another world—before Columbine and Parkland; Orlando and Sutherland Springs; and before these much-covered mass shootings rightfully reminded the public of the regularly occurring violence in lower socioeconomic and minority communities. Back then, guns might have been just toys; now, it’s impossible for me not to see them as charged with the trauma of recent events. I considered that same question again today—should we let our children play with toy guns at a time when the U.S. is grappling with the impact of gun violence?—when I saw the pictures of Prince George holding a rather realistic-looking black toy gun at an English polo match over the weekend. Part of the debate over toy guns has hinged on distinguishing them, clearly, as toys—so as never to be mistaken for the real thing. There are state laws, including one in New York, requiring toy guns be brightly colored, as opposed to black, aluminum, or silver. Perhaps for this reason, the photos stood out: to some eyes, the prince’s looked eerily like a real pistol. “I gasped when I saw the photos,” an American friend said on Facebook. And she has a reason to: America has a gun violence homicide rate that is 25 times higher than that of other developed countries, according to Everytown for Gun Safety; we outrank all other countries in the number of mass shootings that occur here; we own an estimated half of all civilian guns worldwide. A child wielding a toy gun in the U.K., where firearms are much harder to obtain, arouses a different sense of shock or unease than they might in America, though no less alarming—remember the brouhaha when Pippa Middleton’s friend pointed a firearm out of their convertible at a paparazzi? Soto Lamb is a Texas native who was raised around real guns; she grew up playing cops and robbers and revering A Christmas Story—the irreverent classic in which mischievous young Ralphie Parker dreams of his very own BB gun. But she does not allow her two sons to play with toy guns of any kind. While at Everytown and Moms Demand Action, “when my life was a daily deluge of news stories about gun violence in America, and working with mothers whose children had been killed, it was simply untenable to come home and hand my children guns to play with,” Soto Lamb said. Pleasanton schools, police seek to ban foam dart game "Assassin"
The video above shows an example of what kids do during this game. Video might not be safe for work – I believe I heard one cuss word (sh*t) during its play. From SF Gate: When the Pleasanton Police Department converged all available units toward an armed robbery call last January, the presumed crime was not the heist they were expecting. The weapons were Nerf guns. The robbers peeking into the windows were teenagers. And the surveillance of the house in question was part of an elaborate game played by high school seniors that police and school officials are hoping to disband this year. The annual game, known as Assassin, involves seniors from Foothill High School and Amador Valley High School firing foam darts from Nerf guns — often painted to look more like real guns (I didn’t find any videos where kids altered the Nerf guns) — at a list of targets assigned to each player. Each participant pays an entry fee, and after several rounds spread over months, the last player standing collects the winnings, pooled from the entry fees. Police and school officials are warning parents and students that playing Assassin could be dangerous, especially when the police and public are unaware it is an organized game. In the past, players have staged Nerf gun drive-bys and simulated hits in convenience stores that could be confused with real crimes, said Sgt. Julie Fragomeli of the Pleasanton Police Department. School officials said disciplinary action, including suspension, may be taken if students are found playing the game on campus. The robbery call from last year came when neighbors saw people hiding in bushes with what appeared to be guns and peeking into the windows of a house, Fragomeli said. Fallacious calls can drain a department’s resources. When the potential crime is something as serious as an active armed robbery, she said, all available units — from detectives working at the station to traffic patrols — will be sent to the scene. “Had there been a car crash or a heart attack or anything else, those people would have been waiting because of a game,” Fragomeli said. The use of Nerf guns painted to look more realistic is also a concern. Responding officers rely on information from dispatchers, she said, and fake guns can easily be confused for real ones, creating the perception of a very dangerous situation. In October, a student at Las Positas College in Livermore caused a campus lockdown when someone mistakenly thought the Nerf gun he was carrying, though not associated with the Assassin game, was a real rifle. Assassin participants have been known to hide in trash cans, trespass onto private property and even jump out of moving vehicles to target or flee from other players while playing the game. So far this year, no incidents related to the Assassin game have required police involvement, but Fragomeli said January is usually when the months-long game kicks off.